PLEASE REVIEW THESE OFFICIAL RULES BEFORE ENTERING THE CONTEST. ENTRANTS, WHO ARE MINORS: YOU MUST OBTAIN THE CONSENT OF YOUR PARENT OR LEGAL GUARDIAN BEFORE ENTERING THE CONTEST. ENTRY TO THE CONTEST IS FREE AND NO PAYMENT OR PURCHASE IS NECESSARY TO ENTER OR WIN. A PAYMENT OR PURCHASE WILL NOT IMPROVE YOUR CHANCES OF WINNING. VOID WHERE PROHIBITED BY LAW. 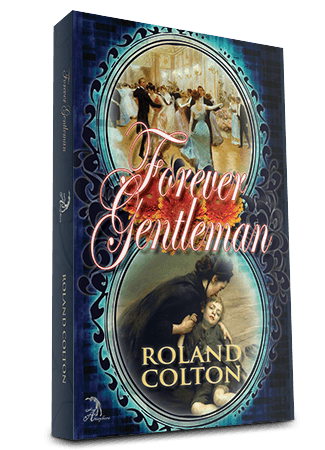 FOREVER GENTLEMAN is a recently published historical novel by Roland Colton, which takes place in London during 1869-1870. The protagonist of the novel, Nathan Sinclair, is a gifted pianist. The novel contains frequent use of and references to piano, violin, orchestral and other classical music in the story. In many instances, Nathan plays pieces which are in the present or past piano repertoire by composers of that era. However, in a couple of notable instances, Nathan composes his own music—these are compositions which are described in the book, but have never been written. Another character in the novel plays a trio of operatic arias; while the arias are well known, the medley of melodies for the violin solo have not been composed as one inclusive composition. FOREVER GENTLEMAN is in the process of creating an electronic version of the novel (i.e., Kindle) that will enable the reader to listen to the music performed in the book, as it occurs. Therefore, the purpose of the contest (“Contest”) is to invite amateur composers (“Entrant(s)”) to compose any of the three compositions described in the book which have never before been composed. The winner of each composition will be entitled to a specific cash prize and will further have his/her name identified and acknowledged in the electronic version as well as any and all future depictions of the novel, or portions thereof, in any other format: i.e., audio recording of the book with the accompaniment of music; film, television of mini-series depictions of the book; film soundtrack and any other musical presentation and/or use, and promotional materials used to market the book in any form, including movie/television trailers, short videos, electronic and/or audio depictions, whether now known or hereafter created, throughout the world and for any purpose. By entering the Contest the eventual winners agree to irrevocably grant the author and/or publisher, producer or other appropriate individual/entity involved in the creation of the book in electronic, audio, video, film soundtrack and/or other depiction of some or part of the book full rights to use his/her composed music in all possible formats of the book without any additional compensation, other the cash prize offered in this contest. There are three separate compositions referenced in the book, for which we are seeking submissions (an excerpt describing each competition is here: Nathan’s Midnight Concerto, Nathan’s Despair and Violin Medley). The Entrant will submit his/her original composition on the Contest Page of the author’s website, selecting the composition title for which the composition is being submitted. “Nathan’s Midnight Concerto”: a composition containing a melody of “triumph and liberation” after the “desperation and struggle of a furious battle” in the key of D major. See excerpt from FOREVER GENTLEMAN here. Length: Although there is no specific length requirement, it is expected the composition will last somewhere between 3 to 7 minutes. However, submissions shorter or longer will be considered. Style: The music composed should be consistent with music from the Romantic Composers, such as Chopin, Liszt, Beethoven, Grieg, Mozart, Mendelssohn, Tchaikovsky, Schubert, Schumann and other contemporaries. Recording Quality: It is imperative that the recording submitted be of the highest quality without any extraneous or background noise. Where possible, it is recommended that the composition be made in a recording studio with highest quality fidelity/audio equipment. The quality must be such that the actual recording submitted may be used in the electronic and/or audio version of the novel. Work must be original music and not contain themes of other composers. “Nathan’s Despair”: a composition of exquisite sadness, gradual descent into darkness, full of dread and hopelessness. See excerpt from FOREVER GENTLEMAN here. Length: Although there is no specific length requirement, it is expected the composition will last somewhere between 2 to 5 minutes. However, submissions shorter or longer will be considered. Style: The music composed should be consistent with music from the Romantic Composers, such as Chopin, Liszt, Beethoven, Grieg, Mozart, Mendelssohn, Schubert, Schumann, Tchaikovsky and other contemporaries. “Violin Medley”: a composition containing melodies of three soprano arias: (1) Mozart’s soprano aria from Rhue Sanft, (2) Mendelssohn’s Elias Elijah soprano aria; and (3) Paisiello’s soprano aria from Cavatina for Nina. Length: although there is no specific length requirement, it is expected the composition will last somewhere between 3 to 7 minutes. Submission shorter or longer will however be considered. Style: The music composed must reflect or be based upon the melodies contained in the above-reference soprano arias and should be reasonably well-balanced melodically between the three. The composer may use the same key for each aria melody or may vary the key for one or more of the aria melody. The composition may also include other original melodies as deemed necessary, provided that they do not detract from the major aria themes. The music should be further consistent with the style of the aria’s composers. Work must be an original, with the understanding that it will be based upon and reflect the melodies from the arias. The presenting sponsor of this Contest is the author of FOREVER GENTLEMAN, Roland Colton (hereinafter referred to as “Sponsor”). To enter the contest, you must agree to these Official Rules (the “Rules”). Therefore, please read the following rules prior to entry to ensure that you understand and agree. You agree that the submission of an entry in the contest constitutes agreement to these Rules. You may not submit an entry to the Contest and are not eligible to receive the prizes described in the Rules, unless you agree to these Official Rules. These Official Rules formed a binding legal agreement between you, FOREVER GENTLEMAN, the Sponsor and any heirs, beneficiaries, representatives, agents, successors, assigns and attorneys of the author and/or anyone receiving the license to market, publish, produce, create and/or develop any electronic, audio, video, film, musical or other depiction of any part of FOREVER GENTLEMAN. No purchase, payment or donation of any kind is necessary to enter or win; a purchase or payment or donation will not increase the chance of winning. By entering, entrant agrees to be bound by these Official Rules and the decision of the judge, who is Roland Colton, the author of FOREVER GENTLEMAN, which decision shall be final. The Contest starts at 12:00 A.M. Pacific Time, October 1, 2017 and ends at 11:59 P.M. Pacific Time on February 28, 2018. All entries must be received by 11:59 P.M. Pacific Time on February 28, 2018. The Contest is open to residents of all countries, where permitted by law. The contest rules will be governed by and evaluated by United States law. To be eligible to participate in the Contest, entrants must be 14 or older. A maximum of three (3) entries per person is allowed. If the Contest winner is under age 21, the contest prize may be awarded to custodial parent(s) or legal guardian(s) pursuant to applicable law. The entrant submitting the music must be the composer of the work, otherwise the submission will not be considered. Third-party submissions of other person’s compositions are strictly prohibited. Qualified entrants shall upload their submissions directly to the author’s website (RolandColton.com) under the Contest page. Submissions must be in the best possible audio presentation, without extraneous or background noise, or they will not be considered. No submission will be considered that does not upload successfully to the Contest Page of the author’s website. Entrants will be required to indicate their acceptance of the Contest Rules at the time of their submission, along with their contact information (including, name, address, age, phone number and email address). Entrant must be the composer of the work submitted. Entrant must verify that the work is Entrant’s original composition. The work may not have been entered in previous contests or for previous awards. It may not have been published in any medium. The Entrant is the one person who owns the email address associated with the Submission, except that an email address in the name of the parent or legal guardian of the otherwise eligible minor entering the submission will be permitted and the minor will be deemed the Entrant. Each Entrant agrees not to submit any Entry that infringes upon any third party proprietary rights, intellectual property rights, personal or moral rights or any other rights, including without limitation, copyright, trademark, patent, trade secret or confidentiality obligations, or otherwise violate applicable U.S. law. Entries violating this section of the rules will be disqualified. Each Entrant is limited to three (3) submissions per composition category. Each Entrant and a parent or guardian will be required to sign a release and affidavit for the Contest entry and must agree to abide by these rules. Each submission must not contain any copyrighted works other than those owned by the Entrant. Use of unauthorized copyrighted works will result in the disqualification of the Submission. By entering, each Entrant hereby releases and holds harmless the Contest and then Sponsor, his program partners and each of his affiliates, heirs, agents, successors and assigns, and any others involved in the development and/or execution of this Contest, from any and all claims, demands, losses, promises, causes of action, and liabilities arising out of this Contest, including travel. Submissions that do not comply in all material respects with the Official Rules or that otherwise contain prohibited content, in the author’s sole discretion, will be disqualified, not published and not considered for prizes. Any false information provided within the context of the Contest by any participant concerning identity, mailing address, telephone number, email address, ownership of the music or non-compliance with these Official Rules, or the like, may result in the immediate elimination of the participant from the Contest. The Sponsor further reserves the right to disqualify any entry that it believes in its sole and unfettered discretion infringes upon or violates the rights of any third party, otherwise does not comply with these Official Rules, or violates U.S. or applicable state or local law. No more than one Entrant shall be chosen and awarded the cash prize for the composition entitled, “Nathan’s Midnight Concerto.” However, if Roland Colton, author and judge, determines in his sole discretion, that none of the submitted works for the composition is of the proper quality and style to be selected for inclusion in the electronic version of the book and other mediums, as more fully described in the Contest Rules, then no winner shall be selected and no cash prize awarded for the composition. Assuming that an Entrant is chosen, the winning Entrant for the composition entitled “Nathan’s Midnight Concerto” shall be awarded a cash prize of $5,000. No more than one Entrant shall be chosen and awarded the cash prize for the composition entitled, “Nathan’s Despair.” However, if Roland Colton, author and judge, determines in his sole discretion, that none of the submitted works for the composition is of the proper quality and style to be selected for inclusion in the electronic version of the book and other mediums, as more fully described in the Contest Rules, then no winner shall be selected and no cash prize awarded for the composition. Assuming that an Entrant is chosen, the winning Entrant for the composition entitled “Nathan’s Despair” shall be awarded a cash prize of $2,500. No more than one Entrant shall be chosen and awarded the cash prize for the composition entitled, “Violin Medley.” However, if Roland Colton, author and judge, determines in his sole discretion, that none of the submitted works for the composition is of the proper quality and style to be selected for inclusion in the electronic version of the book and other mediums, as more fully described in the Contest Rules, then no winner shall be selected and no cash prize awarded for the composition. Assuming that an Entrant is chosen, the winning Entrant for the composition entitled “Violin Medley” shall be awarded a cash prize of $2,500. Cash prizes shall be paid within sixty (60) days of the winning Entrant being notified of winning. No substitution fo the prizes will be allowed. Void where restricted or prohibited. Winners are solely responsible for all taxes and/or fees that may be incurred. All cash winners are required to verify proper and legal identification and Social Security number within 30 days of notification of winning the cash prize. Winner may forfeit any and all cash prizes if verification cannot or has not been made within thirty (30) days. Upon proper verification, cash winnings shall be awarded by check, and mailed to winner’s mailing address. The winner for each composition, if any, shall be notified by phone and/or email and must show picture identification to claim their prize. The Sponsor reserves the right to examine additional identification and may choose to accept or deny awarding the prize based on the identification presented. By participating in the Contest, each participant and prize winners waive any and all claims of liability against the Sponsor and his respective agents, employees, assigns, successors, for any injury or damage that may occur from the conduct of, or participation in the Contest. The prize winners will be required to complete a release and affidavit prior to acceptance of any prize. If the prize winner(s) is a minor in their state of residence, he/she will be required to have a parent or guardian complete the release and affidavit as required by applicable law. By claiming a prize, the prize winners authorize the use, without additional compensation, of his or her name in any manner and in any medium (including, without limitation, radio broadcasts, newspapers and other publications, television or film based upon the book, trailers, press releases, slides, videotape, electronic version of the book, audio version of the book, distribution over the internet, picture data storage or any other medium, whether now known or hereafter created, throughout the world and for any purpose, as the author and Program Sponsor may deem appropriate. To obtain the name of the prize winner(s), send a separate, self-addressed, stamped envelope to: Roland Colton, Sponsor, Forever Gentleman Original Composition Contest, 28202 Cabot Road, Suite 300, Laguna Niguel, CA. 92677. The conduct of the Contest is governed by the applicable laws of the United States of America and any applicable state laws which take precedence over any rule to the contrary herein. All claims relating in any manner to the Contest or to any Submission must be resolved in the federal or state courts of Orange County, California. Program Sponsor is not liable for any lost or stolen entries, prizes, or contest information. Sponsor reserves the right not to award any prizes if none of the entries received measure up to the quality and style worthy for inclusion in the various formats for audio, electronic, television, film, trailers, publicity, soundtrack, recording, music and all aspects and elements thereof, and/or all other medium, as determined by the Sponsor, in his sole discretion. The Sponsor takes no responsibility and assumes no liability for any omissions, acts or damages that may result from the preparing of materials to submit to this Contest. By submitting any entry, Entrants thereby grant the Contest and the Sponsor and his affiliates, subsidiaries, licensees and assigns, an irrevocable, perpetual and royalty-free right to use, reproduce, edit, display, transmit, prepare derivative works of, modify, publish and otherwise make use of the submitted work (including audio, electronic, television, film, soundtrack, trailers, publicity, recording, music and all aspects and elements thereof, and/or all other medium) or any other information in any and all media, whether now known or hereafter created, throughout the world and for any purpose, in addition to other things, the rights granted to the Sponsor include, but are not limited to the right to realize, crop, censor, compress, edit, feature, caption, affix logos to, and otherwise alter or make use of the submitted work. By submitting any entry, Entrants thereby represent and warrant that the submitted work or information does not and shall not infringe on any copyright, any rights of privacy or publicity of any person, or any other right of any third party, and the Entrants affirm that they have the right to grant any and all rights and licenses granted to the Sponsor herein, including but not limited to, all necessary rights under copyright, free and clear of any claims or encumbrances. Entrants acknowledge and agree that the Sponsor shall have no obligation to utilize, post, display, or otherwise make available any work submitted by the Entrant, and may, in his sole discretion, remove, edit, modify or delete any work that the Entrant submits. By submitting any entry, Entrant, its, his, her or their heirs, successors and assigns thereby releases, forever discharges and covenants not to make a claim against or sue the Contest, the Sponsor and their parents, subsidiaries and affiliates, licensees, employees, officers, directors, representatives, successors and assigns of and from all manner of action or actions, causes or causes of action, at law or in equity, suits, claims, demands, liability, loss, cost or expense, of any nature whatsoever, known or unknown, fixed or contingent, which Entrant may have or hereafter have against the Contest or the Sponsor by reason of any injuries or damages Entrant may sustain, whether to Entrant’s person, property, reputation or otherwise, as a result of, incident to, or related in any way to the entry, the contest, or the use, incorporation or exploitation of the entry for any purpose described herein. Entrant waives and foregoes the right to seek injunctive relief against anyone relating in any way to the entry, the contest, or the use, incorporation, or exploitation of the materials for any purpose described herein. Entrant agrees to indemnify and hold the Contest and the Sponsor from and against any liabilities, losses, claims, demands, costs (including, without limitation, reasonable attorney’s fees) and expenses arising in connection with any breach or alleged breach by the Contest of the Sponsor of any representation made in the entry or by virtue of submitting the entry.